Grumpy Cat has yet again made history, this time as being the first real cat to ever appear in the Cats Broadway musical. Grumpy Cat made her debut during Friday night’s show. Staff made her an honorary “Jellicle Cat” and though her appearance onstage was brief, it’s sure to be a memorable one. 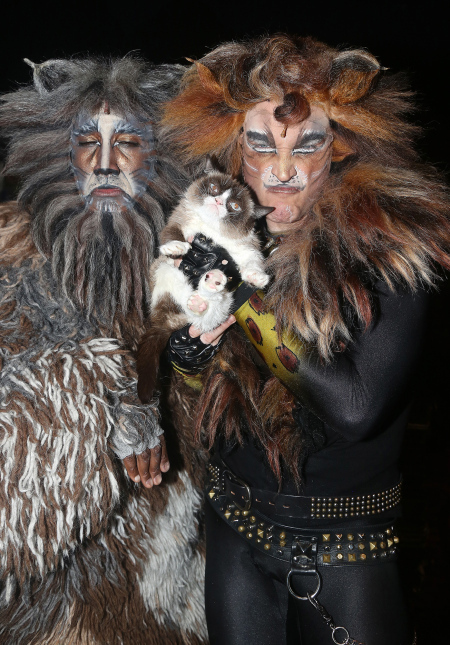 Appearing in the musical isn’t the only unusual thing that Grumpy Cat has done. The frowning feline rocketed to stardom when her owner posted pictures of her scowl online. Today there are countless Grumpy Cat memes, and Grumpy Cat now has over 12 million followers online, making her one of the most popular cats in the entire world. Unfortunately you won’t have the chance to see Grumpy Cat on Broadway again – her appearance was a one-time-only deal. No way.. hahhaa. This is the absolute best.